Most of you know and follow the top wedding photographers from every major city. But when it comes to our own wedding, we realize there is a budget, and none of these awesome guys can cover our weddings. I remember back when I was getting married in 2015, candid photography had just picked up, and even back then every second photographer charged like INR 30k for candid shots. Even if it meant putting a traditional photographer to click random smiling and goofy pictures. It was all over the place. The good guys obviously were expensive. But their talent was well worth the price. But I get it. Talent and all aside, sometimes a budget is a budget, and one’s got to stick to it. I asked a question to brides long back. What would you spend more on? 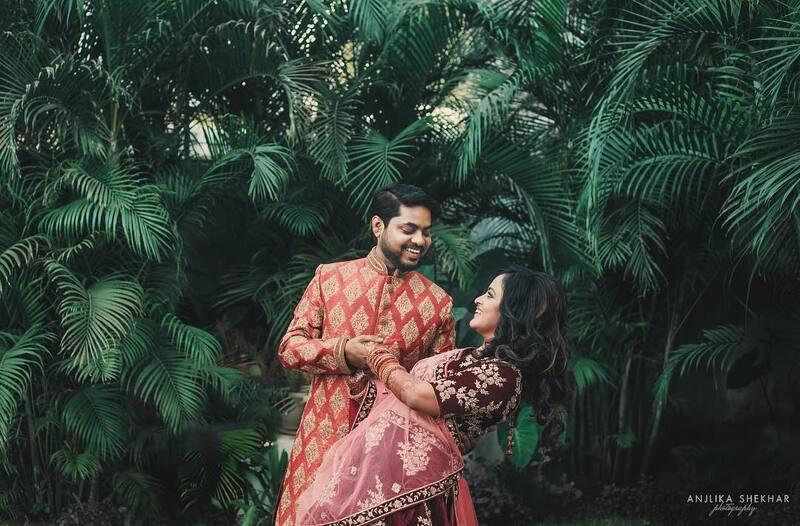 Your Lehenga or your Wedding Photographer? Let me make this a little bit easier. Will you spend 1 Lakh on two lehengas or spend the same 1 lakh on your wedding photography? Tell me in the comments. In today’s post, I am sharing some lesser known gems from different cities. In my last post on Budget Photographers, so many of you asked me to list more. So this post is like a follow up on Budget Photographers. I will be covering candid + cinematography in the price range of INR 1-1.5 Lakhs for 2 days events. That should cover your mehendi + haldi + wedding + reception. P.S. If any of these budget photographers prices are not in the same bracket as what I’ve written, please let me know. I will either update it if they fall in the same range, or remove them from this list so it helps other brides as well. If you want clean photos, nothing too fancy in terms of editing, and just real pictures, then you can check them out. They are based out of Delhi. I really liked some of their pre-wedding photos of brides where they have captured nice moments. After seeing some of their work, I would recommend them for pre-wedding photoshoots. They have done some really nice clean shots of bride and groom. You can check their work on their Instagram page. If you are more inclined towards bridal portraits or just generally singular focussed images for the wedding, then this photography company is pretty decent for the price. I just happened to come across this photography group on Instagram. They are quite popular. If you’re looking for complete wedding photography package, they are really good for the price. You know honestly, it is much more difficult to hunt for good budget wedding photographers in smaller cities than in the big city. In big metropolitan cities, you’ll always have someone starting out who is ready to take up your wedding as a project on budget. But anything other than the big capitals usually face a lot of problem in terms of quality. I came across this group of photographers on Instagram and fell in love with their bridal portrait shots. I haven’t seen much of actual wedding photos to judge them, but these photos are great for the price. Please list few budget friendly photographers of Mumbai..